More than 20 burger tourists descended on Barney’s Gourmet Burgers in Brentwood to sample their menu of 24 different burgers. Barney’s broke their rules to take a reservation for the burger tour and had two large tables waiting for us. The high point from tourists’ comments and scores was Barney’s attentive, cheerful, and attractive waitresses. Everyone got the right order and got it quickly. The burgers received a wide range of reviews with the many newcomers scoring the food lower than the old timers. The comments ran the gamut from “great burgers” to “not bad for foreplay” to “meh” or “aite.” One high point that was mentioned was the bottles of Grolsch Beer that were called “the coolest beer bottle ever!” for the flip tops. 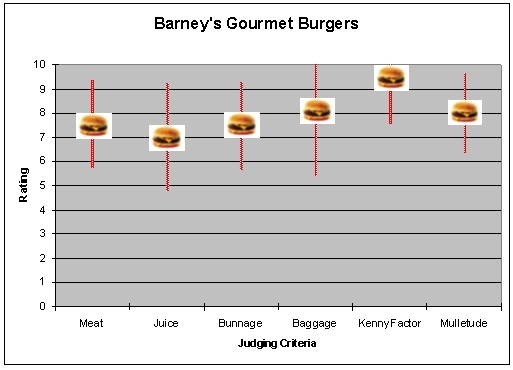 As a change, the wait staff reviewed the burger tour using our score sheets and altering our categories. Comments: Good mix cute group, Good bar recommendations. I think a low score for issues is a good thing. Everyone had fun and we closed the place down. The prices were inexpensive. If you want a huge variety of burgers, great curly fries with incredible ranch dressing, and friendly service, give Barney’s a try.